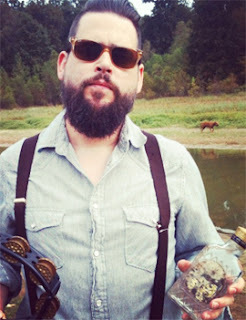 Memphis-born Jason Freeman always had a good time with the barrelhouse, honky-tonk hoo-doo music that's best characterized by the jug band inspired meanderings of the Bluff City Backsliders (among others). For the better part of ten years, he was a talented but somewhat restrained part of a band known for preserving the Delta's richest musical roots. And yet, anyone might suspect that there was something darker, grittier and more organic smoldering under his cool, unassuming surface. All he really needed was a solo debut to uncork the blues out of the bottle and play it like it was meant to be played — unfettered and free, with a little more on the line. Jason Freeman rolls the dice on Hex & Hell. Sure, Freeman sets a slower, more purposeful pace than many have evolved to become rock and roll. But in keeping pure this time around, he provides ten tracks of unadulterated blues with enough passion that it preserves the genre while reminding anyone who loves rock that its roots are borrowed. Freeman himself has frequently been called a walking blues encyclopedia and folk/blues wizard, who has spent all his days reading about music. In fact, he was the guitarist that brought a contemporary edge to Samuel L. Jackson's magical transformation with songs like Black Snake Moan in the film by the same name. Black Snake Moan isn't his first foray into films. Freeman also wrote the score for MTV's Savage Country and contributed tracks to Craig Brewer's Hustle & Flow. One song on the debut album, Magic In My Home, was featured in the remake of movie Footloose. What the film lacked, the music didn't. The swampy, backwoods blues tune conjures up images of old world mysticism long associated with music. He feels every drawn out chug in his guitar and howl in the lyrics, much like the entire album. There is a primal force behind every composition, landing somewhere between a fiery intensity and laid back resilience. The title track, Hex & Hell, is a perfect example. After laying down a strong drum set, the song adds a steady growling guitar and bass line before Freeman opens up his smoky lyrics. The song itself is a character portrait, mostly about a man with a devil-may-come attitude. Bring him on, Freeman invites. The opener, Dirty Heart, takes advantage of the late blues with its near-rock sound but keeps its swamp vibe with a few bluesy slides across the guitar. Florida Watch is much more upbeat with mean, lean instrumental sections that could easily be embellished during live performances. Help Me delivers more bounce in the beat. Hex & Hell has ample highlights, offset only by its consistent pace. The only drawback as a debut album might be the overwrought pace of it. While (Do The) Rump adds some boot-scoot to the lineup, most of the songs find Freeman easing into a tempo with which he is especially comfortable. It works most of the time, especially on the highlighted tracks. Toward the bottom, however, it begins to become too familiar. The drawback is that great songs like Teasin' Me never have a chance to truly capture the spotlight. Instead, they're taken in by the ear as an extension of the greater work. There is nothing wrong with that, but it waters down some of the striking and unique stylistic qualities that Freeman manages to tuck inside so many of these songs. The upside, it can be argued, is how Freeman wraps up some unexpected musical treats in the otherwise consistent foundation. Blues is frequently approached like that. There is a mellow, rolling beat that invites you to settle into a groove before interrupting the mood with bursts of unbelievable clarity. Hex & Hell By Jason Freeman Fires Up 6.8 On The Liquid Hip Richter Scale. The best part of the debut is hearing Freeman open up more with music that wants to be heard in a remote crossroads bar, the kind of place only known to locals. As he continues to get more exposure and experience as a solo performer, it is very likely his music will eventually deliver an intensity as big as his technical talent. Freeman is musician to watch. He is a surprisingly easygoing, down-to-earth performer with a lot of heart. There is no doubt he frequently becomes consumed in the craft, sometimes losing himself in the process. Ironically, this album could have easily fit into the re-emergent blues-rock category and it would have been propelled to the top. But as a blues album, only a few people knew to look for it. Maybe that will change now. You can find Hex & Hell by Jason Freeman on iTunes. Hex & Hell can also be downloaded from Amazon. According to Freeman's Facebook page, a vinyl and CD release are also forthcoming. They will be offered online and at local Memphis record stores, possibly making physical copies rather rare in a few months.